In the post Location Data Quality for MDM the different ways of handling location master data within many companies was examined. Location data are handled for different purposes using different kinds of systems. 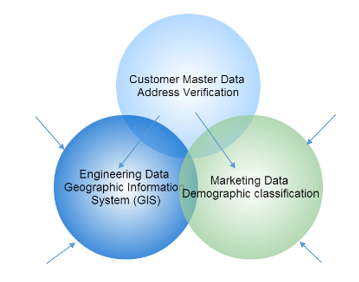 Customer data may be data quality checked by using address validation tools and services, which also serves as prerequisite for better utilization of these data in a Geographical Information System (GIS) and in using internal customer master data in marketing research for example by utilizing demographic classifications for current and prospective customers. Often additional external location data are used for enrichment and for supplementing internal master data downstream in these specialized systems. It may very well be that the external location reference data used at different points does not agree in terms of precision, timeliness, conformity and other data quality dimensions. 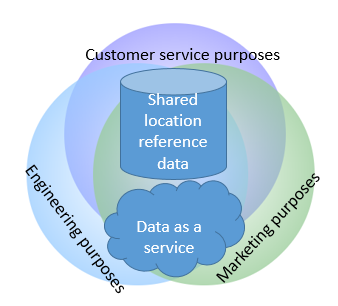 In this set-up everything that can be shared across different purposes are kept as common (big) reference data and/or are accessible within a data-as-a-service environment maintained by third party data providers. I think that your suggestion is good. However, I would add a few tweaks. The first of these would be to include all Party data as opposed to just Parties who are playing the Role of Customer. I would restrict the use of Data as a Service to role of validating Location Addresses on input and then hold the true Location as an internal Master Entity. The reason for this is that many larger enterprises, such as railways, refineries, utilities, etc. will have a mixture of valid locations, some of which will be known by Cloud data sources and others which will not be known. Thanks John. I agree about that a customer is a party playing a certain role at a given time. In this case customer is though used as an example, where there will be many more business cases depending on industry and specific activity. Your point about known addresses is very valid too. It is in fact a use case currently very close to me. I’m working with such challenges within utility. For example, when a new house needs electricity, water and fixed line communication engineering starts to work with the location maybe before the address and property is known in public sources. Customer service may be involved too at a time. Therefore the location is created as internal master data. At some point in time the location will be known in public sources and it will be feasible to make this internal master data linked to the external reference data at that point. Managing that for all purposes must be part of data stewardship functionality.